It happens to everyone: you go into your cabinet and pull out a loaf of bread to find a green fuzzy spot on one of the slices. You'll probably do one of two things. Either you cut off the mouldy part and eat it anyway or just throw it out. According to the USDA, mould can cause allergic reactions or respiratory problems and certain kinds of moulds produce poisonous mycotoxins that make people sick or cause infections. Invisible bacteria can also grow alongside mould, which makes it even more dangerous to consume. 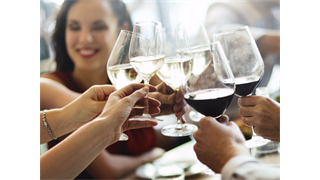 Even though you should definitely toss your mouldy bread in the trash, there are a four types of foods you can still eat as long as you cut off the mould, according to the USDA Food Safety and Inspection Service. But be careful, the USDA also keeps a list of other foods you should always throw away if you spot mould. Hard salami and dry-cured country hams are OK to eat if they seem a bit mouldy. 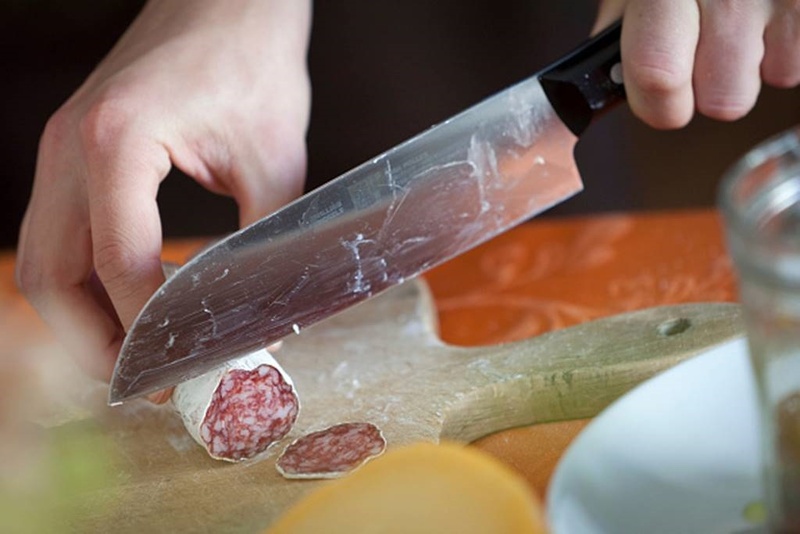 The white coating around certain hard salamis is actually a dusting of a benign mould which helps cure the salami and preserve it from bacteria. It is also normal for dry-cured hams to develop some surface moulds. As long as you scrub the mould off your cured ham, it is safe to eat. Firm fruits and vegetables with low moisture such as carrots, cabbage, and bell peppers can handle a little bit of mould. Moulds have a harder time growing roots in dense foods, so if you cut off at least 2.5cm around the spot of mould, you should be fine to eat your firm fruits and vegetables. Just make sure to keep the knife out of the mould to avoid cross-contaminating your produce. You can eat hard cheeses made without mould such as cheddar cheese. As long as you cut off at least 2.5cm around the mouldy spot and re-cover the cheese in a clean wrapping, your hard cheeses should be safe to eat. 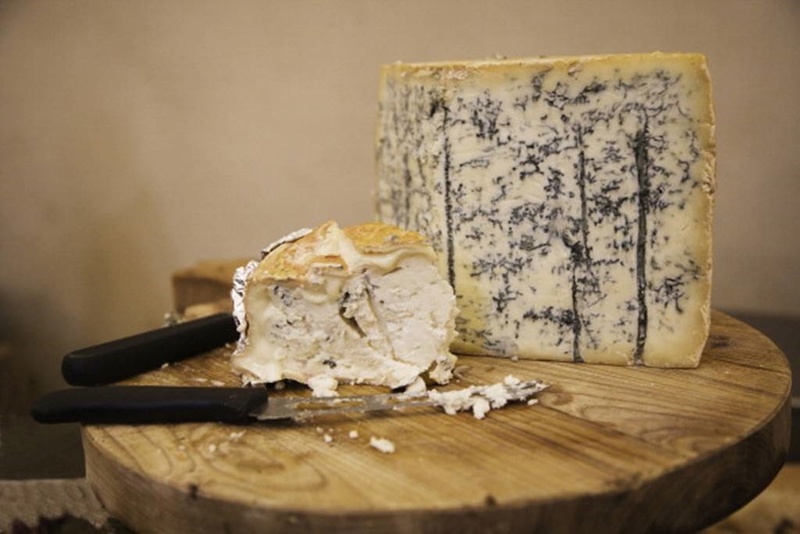 Certain cheeses made with mould, such as Gorgonzola, are OK to eat, even if you notice mould. Obviously, there are a lot of cheeses that are made with mould, including Roquefort, blue, Gorgonzola, Stilton, Brie and Camembert. You have to be careful, however, when they develop other kinds of mould not used in the manufacturing process. If your softer cheeses like Brie or Camembert grow mould, you should throw them away. For harder cheeses like Gorgonzola or Stilton, you can cut off at least 2.5cm around the mouldy spot and keep eating it. Bread and baked goods with mould can be dangerous. It is easy for mould to grow and contaminate soft and porous foods like bread and baked goods. 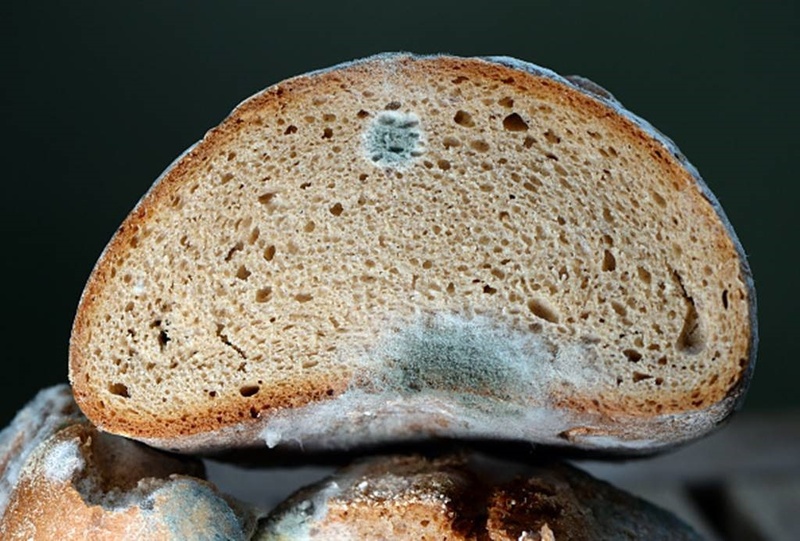 One common mould that grows on bread, Rhizopus stolonifer, also called black bread mould, can cause deadly infections. Instead of risking sickness, baked goods with mould should all be thrown away. 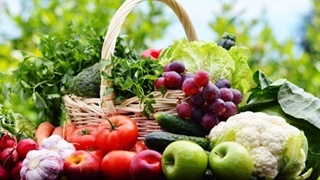 Soft fruits and vegetables such as cucumbers, peaches, and tomatoes are a no-go if they have mould. 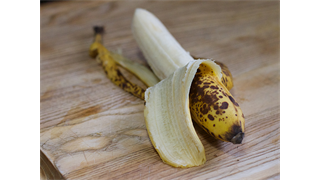 Fruits and vegetables with high moisture content are more easily contaminated by mould below the surface and should just be tossed in the trash. Soft cheeses and crumbled, shredded, and sliced cheeses are best avoided. 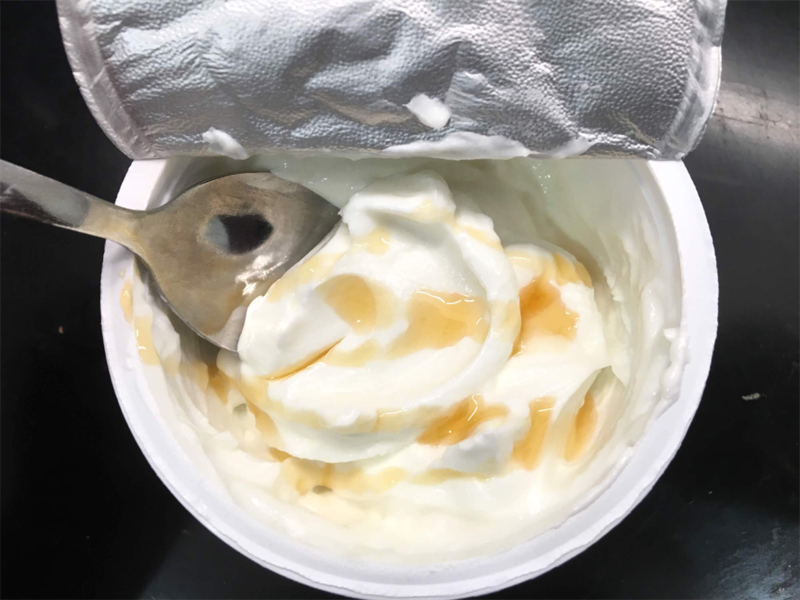 Soft cheeses including cottage cheese, cream cheese, Neufchatel, chevre, and Bel Paese should be thrown away if you find mould because the high moisture content makes it easier for the cheese to be contaminated below the surface and there is a likelihood of bacteria growing along with the mould. Cheeses that are crumbled, shredded or sliced and have mould on them should also be thrown away because it is possible they were contaminated by the cutting instrument. Peanut butter, legumes, and nuts are at risk for dangerous moulds. Foods that are made without preservatives, like nuts and legumes, have a higher risk of developing mould and those moulds are more likely to produce dangerous toxins. Jams and jellies should be tossed. The mould that grows in jams or jellies could be producing a mycotoxin, so even if you scooped out the mould, you're still at risk of consuming poisonous toxins. Instead, you should just throw out your mouldy jams. Any food with high moisture content should probably be discarded. It is easy for mould to grow below the surface of foods with high moisture content. Those foods are also at higher risk of invisible bacteria growing alongside the mould, which makes it even more dangerous to eat. The USDA recommends throwing away any of these high-moisture-content foods if you find mould: lunch meats, bacon, hot dogs, cooked leftover meat and poultry, cooked casseroles, cooked grain, cooked pasta, yogurt, and sour cream.